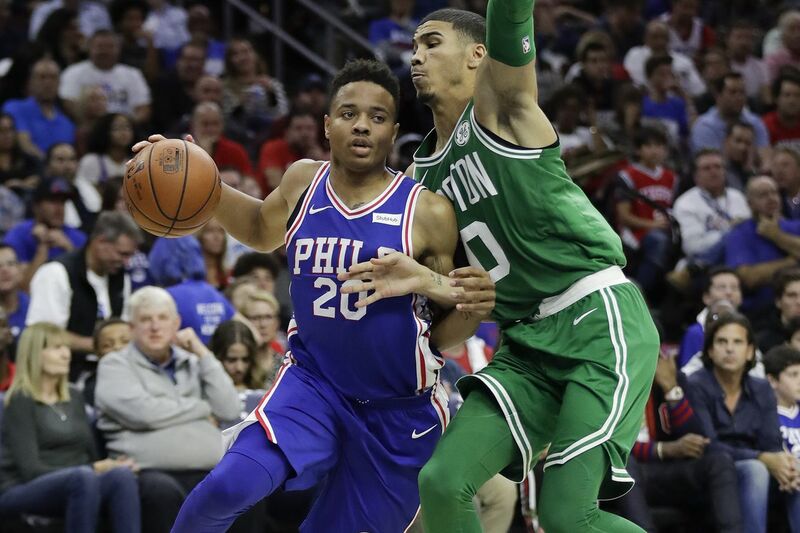 Sixers guard Markelle Fultz tries to drive past Celtics wing Jayson Tatum during their rookie seasons. BOSTON — On June 19, 2017 the 76ers traded away the No. 3 pick in the upcoming draft to the Boston Celtics for the No. 1 overall pick and a future first-round pick. Three days later, the Sixers drafted Markelle Fultz at No. 1 and the Celtics took Jayson Tatum. The two were linked. What followed was a year of comparisons and speculation that was brought to a head during the second round of the 2018 NBA playoffs. The Sixers-Celtics rivalry was reborn. Both teams were loaded with young talent, which included Fultz and Tatum. But, Fultz's rookie season was anything but ordinary. He missed 68 consecutive games in the regular season and would not see the floor during the series against the Celtics. While Fultz was sitting on the bench, Tatum was flourishing, becoming just the second rookie to post 10 games of 20 or more points during his first playoff run. The rhetoric about the two young players was everywhere. Looks like Boston made the right choice. It must be tough to be Markelle Fultz and watch what Jayson Tatum is doing during these playoffs. For Fultz and Tatum, none of what was being said could have been further from the truth. It wasn't the the pick swap, or the NBA that linked the two, they had been friends for years. "It actually started in high school," Fultz said. Fultz attended DeMatha Catholic High School in Hyattsville, Md., just outside Washington D.C. and Tatum spent his high school days at Chaminade College Preparatory School in St. Louis, Mo. "We played Chaminade my junior year and my senior year," Fultz said. "We were both competitors and we respected each other's game so it just kept building from there." In fact, both players had some of their most notable games when they faced one another. In his junior year, Fultz hit game-winning free throws against Chaminade and finished with 16 points despite being guarded all night by Tatum. In their senior year Tatum had a 40-point game in a win over DeMatha. Then there were camps, and invitations to prestigious games. Both players were on the 2016 McDonald's All-American team, and attended the Nike Hoop Summit the same year. "There's a lot of guys at these camps that we would go to and the McDonalds game for example," Tatum said. "I'm not close to everyone that was there, but it just happened naturally with Markelle. You sit on the bus together, you start talking, and find something in common." Both Fultz and Tatum are on the quiet side, but when Fultz gets comfortable he becomes the life of the party, according to Tatum. "Markelle is a really funny guy. He jokes around a lot, I think a lot of people don't see that he's really funny," Tatum said. "He always has a smile on his face." The two kept in contact through college and the draft process, their friendship growing. Then, Fultz's rookie season took a turn. While the voices on the outside were pitting the two players against each other as rivals, the narrative couldn't have been different from where they were standing. "That's what everybody does, they try to turn friends into enemies," Fultz said. Tatum said there wasn't a single moment that he thought about the trade, or what might have been if he'd ended up on a different team, and he's never seen Fultz as an enemy. Through it all, he was just concerned for his friend and hoping for the best. "It was tough, because I know him, I know his mom and his family. It was just kind of weird what happened, you don't see that too often in basketball and Markelle is a quiet kid so nobody was hearing his side of it," Tatum said. "The adjustments of being a first-year player are already difficult and then you add what he went through. I was rooting for him the whole time because he's a friend of mine." Sixers guard Markelle Fultz gets fouled by Boston Celtics forward Jayson Tatum during the second-period on Friday, October 20, 2017 in Philadelphia. Fultz returned to play with just 10 games left in the 2017-18 season and made three short playoff appearances in the Sixers' opening-round series against the Miami Heat. When the Sixers were closed out by the Celtics in five games, Fultz reached out to his friend to congratulate him. "He texted me after the game to tell me that I did a good job even when he wasn't playing," Tatum said. "That's the kind of guy Markelle is." After the season ended, Fultz teamed up with shooting coach Drew Hanlen in Los Angeles to work on regaining his shot. One of Hanlen's long time pupils is Tatum. "I've been working out with Drew since like eighth grade" Tatum said. So everyday that Fultz would walk into the gym this summer it was either before, after, or in tandem with Tatum. It wasn't weird and there were no ill feelings, quite the opposite actually. Fultz said he was really looking forward to putting in hard work over the summer, but having people he knew working out with the same trainer and in the same place made everything feel a little more comfortable and easy. "People will try to make us enemies and go against each other but that's not what it's like from our standpoint," Tatum said. Both are looking forward to being able to go against each other in games again. They'll get their first shot when the Sixers and Celtics open up the 2018-19 season in Boston on Oct. 16. First and foremost, the two budding stars are competitors and say that's how they see each other on the court. Off the court, they're rooting for each other. "We know that we're friends and we're going to continue to be friends," Fultz said. "We hit each other up all the time and comment on each other's posts. He's probably one of the flyest guys I know. That should be the headline: Jayson Tatum is the flyest guy that Markelle knows."